The most uniquely designed countertop bath accessories we have ever seen. Smooth matte finish stoneware with soft lines. Feels luxurious and substantial in weight. The finish will also reduce the sight of fingerprints. Made in Germany. Tumbler: Thick stoneware construction with a smooth matte finish. The opening and shape of the tumbler is almost triangular. Really unique and ergonomically designed. 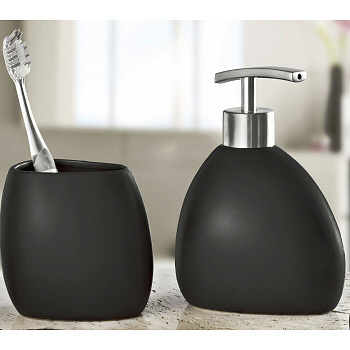 Soap Dispenser: Soft matte finish stoneware with a brushed chrome pump. this dispenser holds 13.5 ounces of liquid soap. Soap Dish: Soft matte finish stoneware in some what of a triangular design. Toilet Brush Set: Really beautiful stoneware with soft smooth matte finish. Black: Matte black finish with soft feel. This stoneware is so soft it is hard to believe it is a hard material. White: Matte white finish with soft texture.